I was astonished when I realized that copying & pasting a line in VS 2010 doesn’t works the same as in previous versions of Visual Studio. I was blogging more than a year ago about wonderful feature how to copy and paste in Visual Studio. In previous versions you can copy a line by moving cursor anywhere on a line you want to copy and without selecting anything press Ctrl-C. Then you can paste that line anywhere by pressing Ctrl-V. 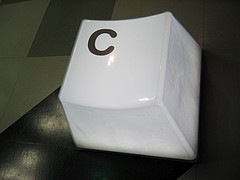 The line will be inserted above the line where the cursor is without breaking that line. However, in VS 2010 CTP the same technique will not work despite that option to turn this feature on/off exists in Options dialog. Just open this dialog by selecting Tools/Options and then select Text Editor/All Languages. 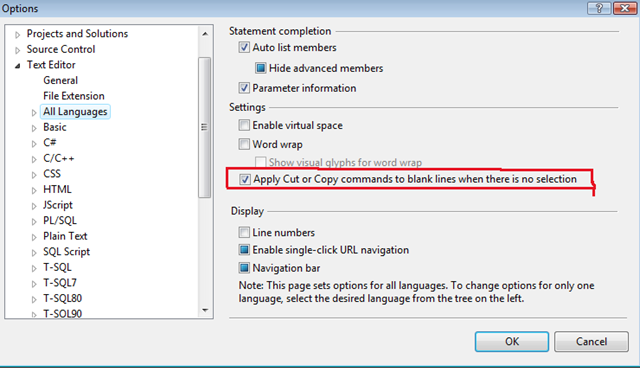 ‘Apply Cut or Copy commands to blank lines when there is no selection’ check box should be checked by default. Actually in previous VS version I notice the same broken behavior with XAML files. I really hope that Microsoft will make copy & paste work as before. I’m so used to move line up or down with Ctrl-C and Ctrl-V keys.